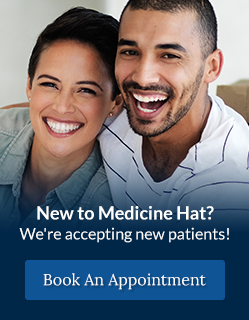 Medicine Hat Dentist, Dr. Douvis was born in Medicine Hat and raised both in town and on an acreage just south of Dunmore. Together with his wife Voula, their daughter Christina, and their son Spiro, they have since taken up residence in the city. He is currently into his 21st year here at River Dental and his 19th year as a partner. While growing up, Dr. Douvis played all sports but had a special interest in hockey which he still shares today. Although he does not play as much as before, he has shifted most of his focus to coaching. He has coached Atom A and B, Junior B, PeeWee AA, Midget Girls, and Bantam AAA. When not spending time with his two children, Dr. Douvis enjoys volunteering some of his free time with groups such as the United Way. He also served in the past on the Board of Directors for Junior Achievement for seven years. He presently serves on the Medicine Hat Minor Hockey Board and on the Medicine Hat Adult Rec Hockey Board. He has been a guest speaker at Medicine Hat Minor Hockey awards banquets and also at the Medicine Hat College convocation ceremonies. With his partners, Dr. Douvis serves the Medicine Hat Tigers with all of their dental reconstruction needs. Since joining the clinic, Dr. Douvis and his team have committed themselves to upholding the quality of care that this clinic has offered since it first opened its doors almost 40 years ago. With his receptionist Meredith Eaton and Level II dental assistants (Tennille Erb, Sandra Martinez, and Taryn Hacking) Dr. Douvis has maintained a focus for his patients of comprehensive dental care. With more than 18 years behind them and many more in the future, Dr. Douvis and his team would like to share their appreciation for the other great people who work at River Dental.